I’ve been seeing this gift wrapping trend all over Pinterest since November and now that we’re days away from Christmas, it seems like the perfect time to share it with you. You can find many tutorials on the web but the gist of it is really easy: Place the gift/item in the middle of a square fabric diagonally (it should look like a diamond shape in front of you), take the top and bottom corners and fold it over the item, and then tie the two remaining corners into a secure knot. A piece of cake! The fun comes in the decorating part. You can adorn your gift with pompoms, tassels, dried flowers, twigs, or a DIY gift tag. Using fabric instead of paper is sustainable in a lot of ways—your friends and family can reuse it for future gifts or for other purposes it may serve around the house. 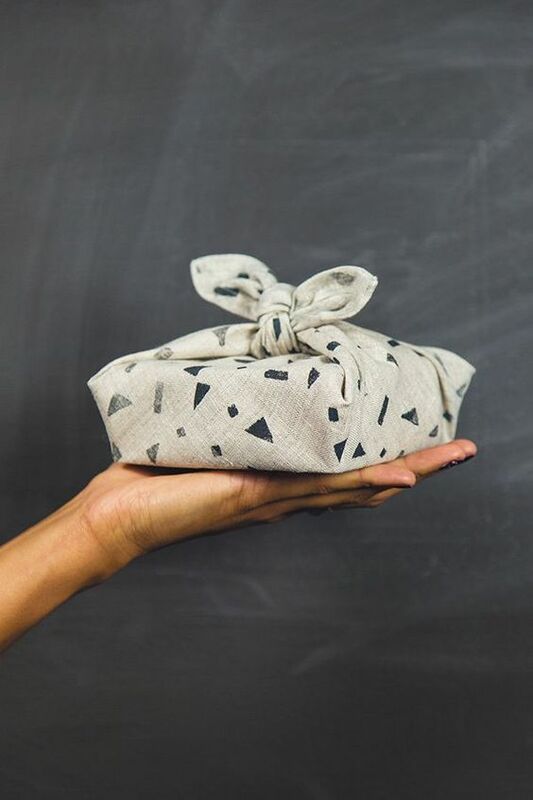 From kitchen towels to pretty scarves, these might as well serve as second gifts. Or if you want to go the extra mile, you can dye the fabric first and paint different patterns. Just be sure to use natural and non-toxic dyes.